Whipping up a batch of Homemade Granola is super easy, quick and allows you the ability to add the ingredients you and your family enjoys most. 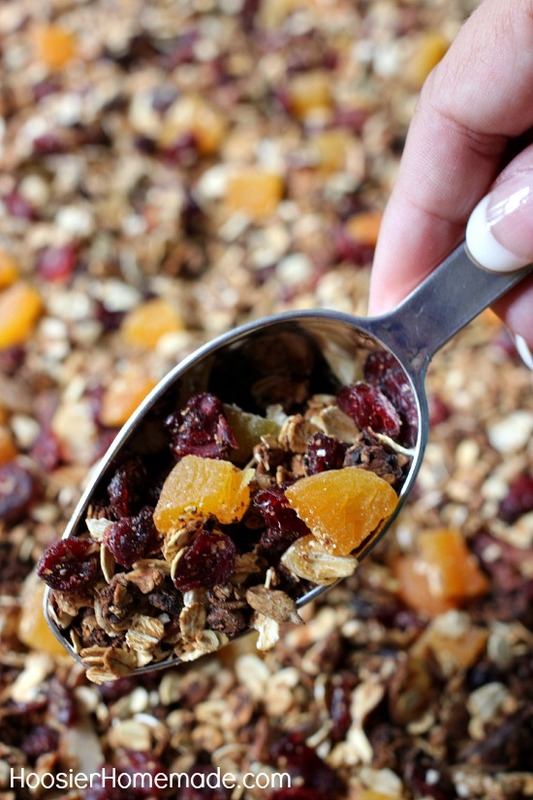 This Cinnamon Vanilla Homemade Granola is packed with delicious ingredients like nuts, dried fruit, cinnamon and vanilla. They say that breakfast is the most important meal of the day. And for me, that is definitely true. Not only do I love all breakfast foods, and would be happy to eat them for every meal, but I also simply feel better when I have a healthy breakfast. 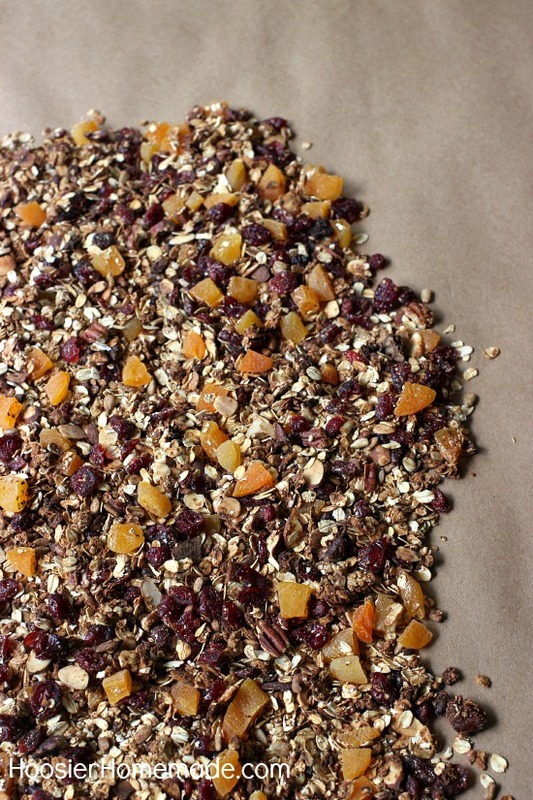 Making your own granola is also easy enough the kids can help. Several months back I started eating yogurt every morning. Some days that is all I have time for, but other days I eat it as a morning snack before my regular breakfast. Most of the time I add dried cranberries, or fresh fruit if we have some. 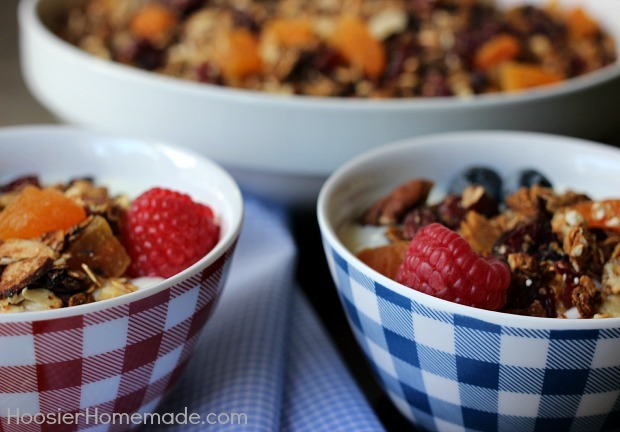 Since making this batch of easy homemade granola, I have been enjoying my yogurt even more. Having good recipes for homemade granola is invaluable. There are so many different ingredients you can add, to the basic granola recipe with a combination of old-fashioned and quick cooking oats, I added pecans, almonds and sunflower seeds. While shopping a couple months ago for snacks to take to baseball games, we discovered dry roasted Sunflower Kernels, they make a great snack, are perfect in recipes like this granola and are inexpensive. Oh and they are good for you too! 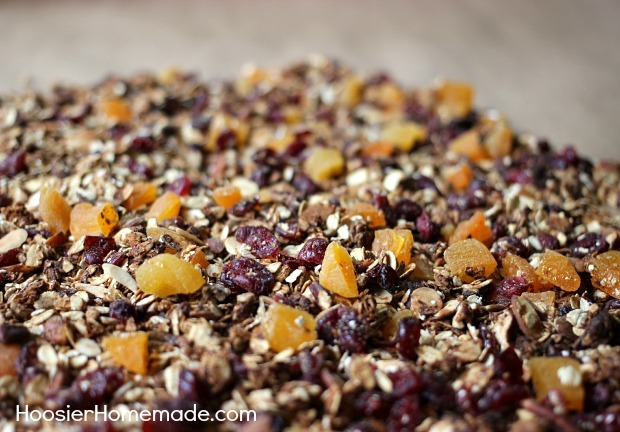 I also added my favorite dried cranberries and dried apricots, but any dried fruit will work. And if you and your family enjoy snacking, having a healthy granola bar recipe like these with Peanut Butter is perfect! 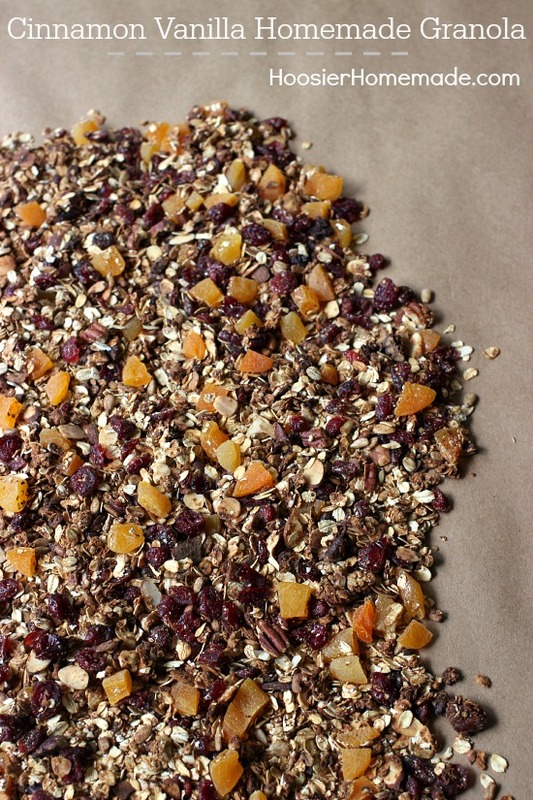 The original recipe for this Cinnamon Vanilla Homemade Granola comes from Mazola. As someone who has high blood pressure, it’s important to take care of my heart. Mazola® Corn Oil contains the highest amount of naturally occurring, cholesterol-blocking plant sterols per serving. So what does that mean for us? It’s a better option for your heart health. 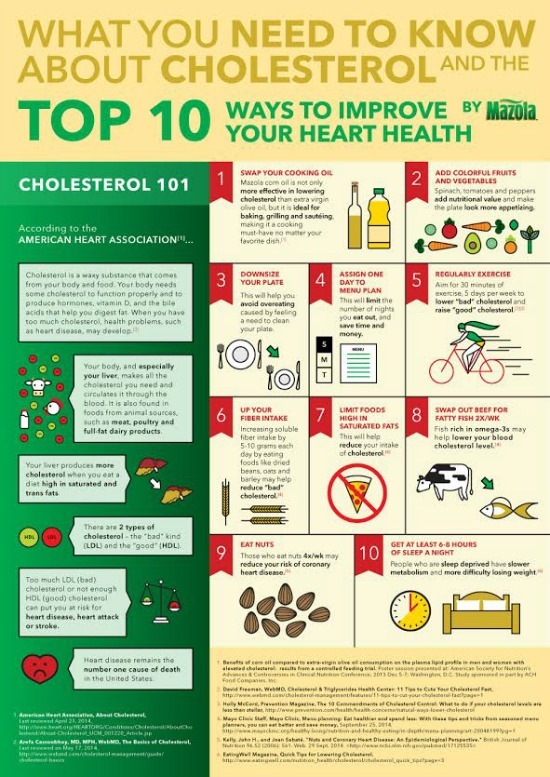 New research shows corn oil significantly reduces cholesterol with more favorable changes in total cholesterol than extra virgin olive oil. Did you know that corn oil has a unique combination of healthy fatty acids and plant sterols, which research suggests help lower cholesterol? Corn oil has four times more plant sterols than olive oil and 40 percent more than canola oil. And as a high blood pressure sufferer, I know that cardiovascular disease remains the number one cause of death in the United States. There are several delicious heart healthy recipes using Mazola® Corn Oil over at Mazola.com. Remove from oven and add back to large bowl, stir in dried fruit. I love making granola! I’ll have to try your recipe! Thanks for stopping by Kristen! 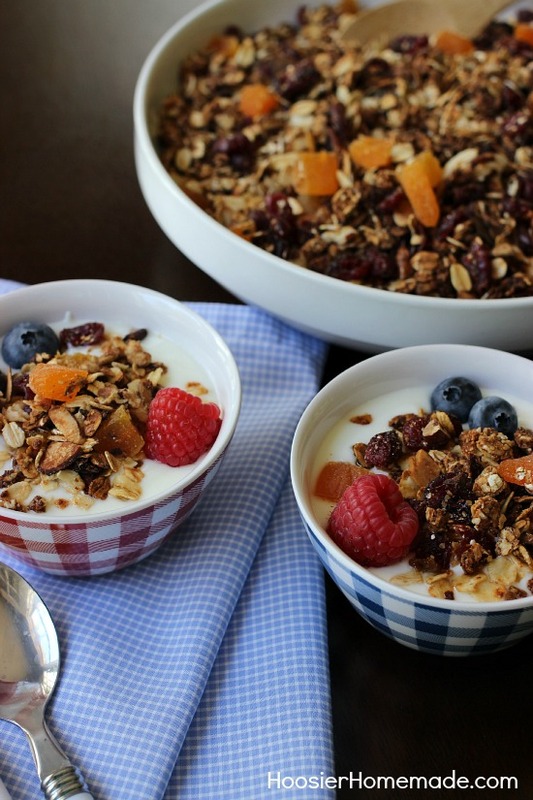 This granola is great on yogurt! I need to go back to making granola at home. This looks divine. As gorgeous looking as it is tasty! Cinnamon is one of my favorite flavors! This granola looks fantastic! Oh, I love homemade granola! This sounds excellent!